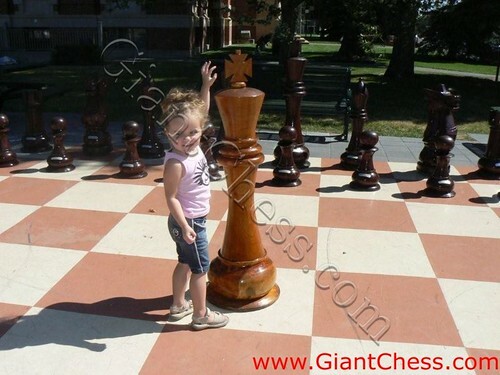 This 48 inch set of giant chess is perfect for the garden or conservatory. Enhance your garden, park, house or hotel with a giant chess set or giant chess piece in teak wood - they are created with the highest ornamental craftsmanship. Wooden chess pieces make an attactive garden feature and allow participants from beginners to expert. These sets are also suitable for hotels, pubs, parties and public events. Dressing your garden with this beautiful decorative chess. Make your guest feel comfortable in visit your garden. This chess is also suitable for small garden or even conservatory. Children often play in the garden because they wanted the air and free atmosphere. If your garden contains only plants and trees, it was less complete. For that reason, don't think to put any decoration in your garden. Just decorate your garden with the giant chess pieces and your children will be more comfortable playing at home and not going out of the house.